I am so excited to share six simple activities with you today to help you celebrate the Opening Ceremonies this week! 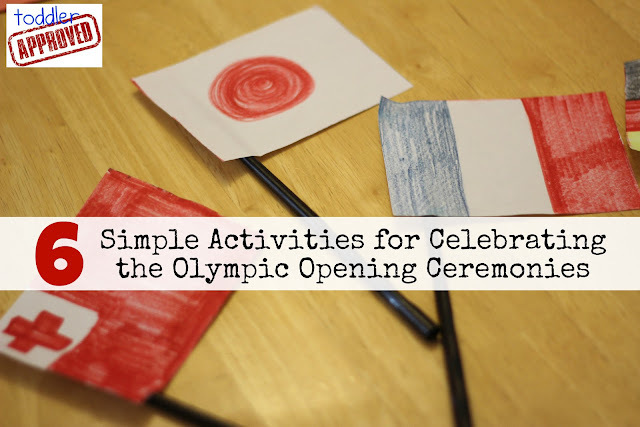 As part of our weekly "Camp Mom" get together with friends, we did five simple activities with the kiddos to help kick off the Olympic themed week. 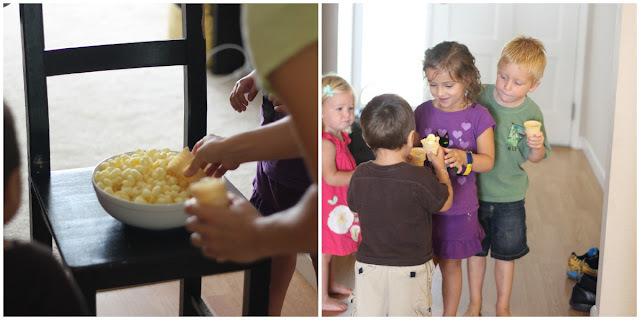 My friend Chrissie collected the ideas that I am sharing and we had a blast trying them out with our two preschoolers and two toddlers. 1. Read some Olympic themed children's books. We started off the day by reading a few select pages in G is for Gold Medal: An Olympics Alphabet by Brad Herzog. 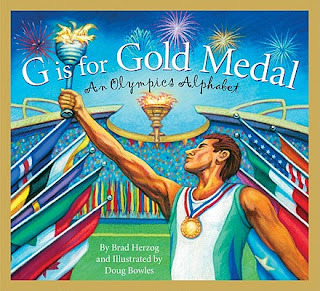 The book has beautiful illustrations and lots of great detail and Olympics information, but isn't one that will keep a small group of young kids completely engaged for very long. It is perfect to read in segments, so my friend Chrissie shared a page or two, then we did an activity, and then she shared a few more pages. 2. Watch the Opening Ceremonies and re-enact them! We watched a short video clip on YouTube of the Beijing Opening Ceremonies (the last Summer Olympics) which really got the kids excited. My son wanted to watch it again and again later in the day and is now asking me how many days until the Opening Ceremonies. He especially liked the torch lighting and the fireworks. After the kids watched the video clip, they each got a flag (shown above) and Chrissie taught them how to say "hello" in that county's language. Then she helped them practice using their new words and when she would say hello in their country's language, they got to get up and parade around the family room waving their flag. The activity ended with everyone running around waving their flags like their own mini Opening Ceremonies. They loved it! 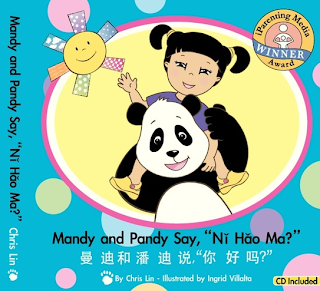 This week as part of the MeMeTales Readathon 2012 Global Cultures theme you can access two Mandy and Pandy books by Chris Lin that teach your kids Chinese. These have been so fun to read with my son along with our Olympic Ceremonies activities because they teach kids simple words in Chinese. Learning words in a new language was one of the favorite activities at our Camp Mom this week! This project is super simple and one that you can find tutorials for all over the internet. Chrissie kept it easy and we just wrapped foil around toilet paper rolls and then we ripped colored construction paper and stuffed it in the top to create flames. This activity was a hit. It was chaotic and crazy, but my son is still talking about it. He loves pirate's booty. You could do this with popcorn too. 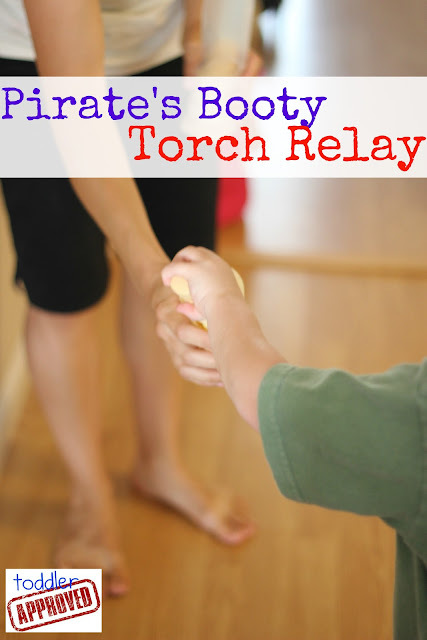 The kid who started the relay had to fill up their empty ice cream cone with pirate's booty and then go and "light the next torch" by dumping their pirate's booty into their friend's ice cream cone... and then pass theirs onto the next kid... and on and on. Loved it! Then the kids got to chow down on pirate's booty and my two kiddos were in heaven! This activity doesn't really need any explanation. It is always a favorite with preschoolers. Fruit loops (or their generic equivalent) plus some string or ribbon makes for a simple threading activity. Chrissie told the kids the cereal rings were "Olympic rings" to make it extra fun... and they loved making their necklaces and eating them when they were done. This is another activity that really needs no instructions. 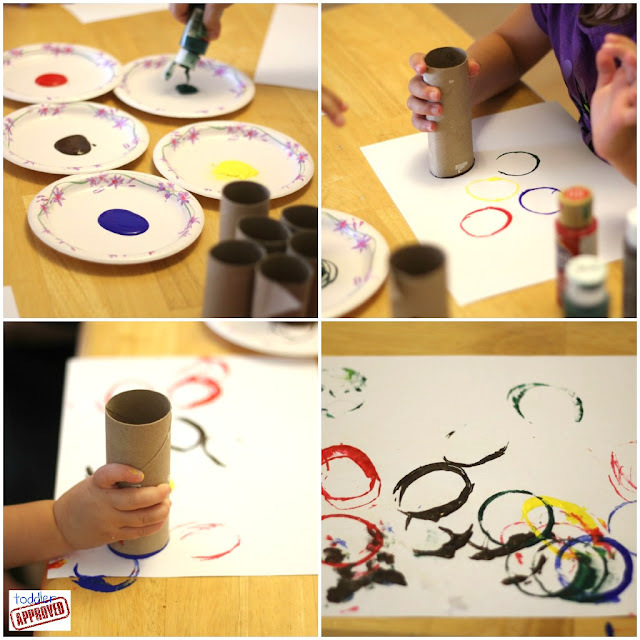 It is a perfect painting activity for toddlers and preschoolers because it is so open-ended. The Mother Huddle shares a wonderfully simple tutorial for this project here. As you can tell, the kids had a great time getting ready for the Opening Ceremonies! Will you be watching them on Friday? How will you be celebrating? We'll be sharing Olympic Opening Ceremonies themed activities this week as part of Toddler Approved's Camp Mom series! Yesterday we shared a simple Lego Ring sorting activity. If you missed our Bug Week posts from last week, you can check out the round up here. The first week of Camp Mom was filled with Camp Crafts. If you missed any of them, you can find them here. Make sure to stop by at the end of the week and link up your Olympic posts in our Kid's Co-op Linky! What wonderful Olympic crafts and snacks! The relay looks like great fun! FUN stuff!!! 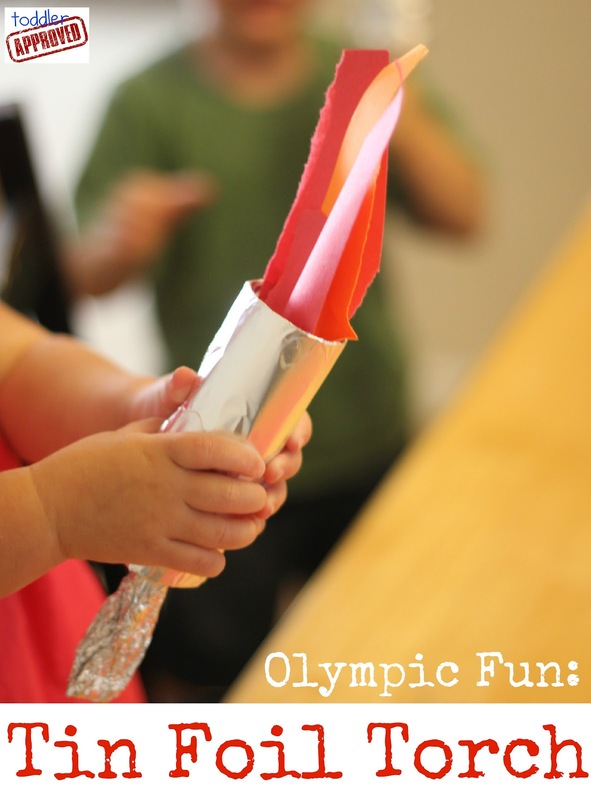 We made a tin foil torch too! (It's part of our Camp Sunny Patch post). LOVE these ideas! Can't wait to read your post over at M&D!